History repeats, if you’re just willing to listen. The “Dead-Cat-Bubble” is dead as global stocks enter a bear market (down 20% from May 2015 highs) and US equities catch down to the rest of the world. Trillions in printed money around the world and its deja vu all over again for the idiocy of “wealth creation”-driven sustainable consumption. He is right, and yes: the world’s billionaires and highest profile actors may be in Davos with their private jets ‘representing’ the world’s middle class, railing against the unfairness of inequality and “attacking corporate greed” (#Ref!) but at least the fiddling will be surrounding by the usual fawning “journalist” groupies, proudly on deck to ask preapproved and scripted questions resulting in even more scripted answers until the farce is repeated again 12 months from now.. If you still own stocks and mutual fund shares, you still aren’t grasping the systemic risk in the stock market. No matter what you claim to BELIEVE, it is your ACTIONS that actually determine your true grasp of reality. Failing to sell all your stock holdings right now could result in massive losses as the world’s bubble markets continue with an implosion that could wipe out 50% of current valuations for many stocks. 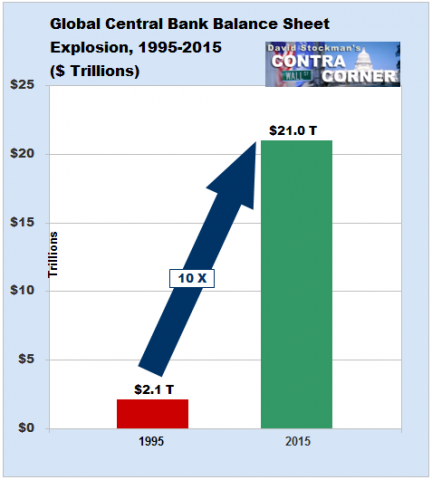 The massive market bubble currently in place has been propped up by a steady stream of fiat money being printed by the Federal Reserve and handed out to banksters who have ties to Washington. This, combined with near-zero interest rates, is the only thing propping up the bubble market (and creating the illusion of economic prosperity). High-tech companies are back into bubble territory with unrealistic valuations based on hype and vapor. Meanwhile, the corrupt mainstream media continues to lie to the gullible public, telling them the market can only go UP… even as it careens on the verge of systemic collapse. The systemic nature of the global banking system and its insane derivatives debt means the next collapse will be a SYSTEMIC firestorm that’s unstoppable and absolutely devastating. Pensions, bank accounts, investment funds, bonds and much more will be nearly wiped out, and the corrupt, criminal government regime will make sure everyday Americans are the ultimate losers when the dust settles. Watch for desperate headlines from propaganda financial outlets (such as MarketWatch.com) like, “10 reasons you shouldn’t sell” or “The upside potential of the market is HUGE!” These are psychological operations to try to persuade people that the collapse they’re seeing in global markets isn’t actually happening. The nation’s capital is now under a blizzard watch, the first watch of its kind issued in advance of Winter Storm Jonas. Now is the time to prepare for Winter Storm Jonas, which is expected to kick into high gear Friday and pummel parts of the East through the weekend with heavy accumulations of snow and ice. Strong winds will likely add to the threat of power outages and may also bring serious coastal flooding along parts of the Atlantic coast. ^^^WOE! WOE! WOE! …WOE!!!! The Holy Spirit Of Our Father in Christ put this same revelation upon more than just Rick, and as always when the revelation pours out it comes at the same time. Obozo’s fruits showcase a deliberate pattern of High Treason and treachery. We are given over to strong delusion, to believe lies as the nation chooses to remain blind to what is happening right in front of it. I read an interesting entry on one of the discussion forums I peruse from time to time from a fellow with the moniker of Sierra D. He put together a very cogent series of ‘suddenlies’ that have grown to prominence or are happening under the Obozo regime we currently suffer under. These all-of-a-suddenlies when check marked together create a very disturbing picture about what is transpiring under our very noses. As I meditated on his observations, there were a number of additional facts and issues that more than bolstered his point and I thought it important enough to share what he shared, and add a few other all-of-a-suddens that I recalled to illustrate the fruits of Obozo in regards to our safety and security as a nation. So thanks to Sierra D for inspiring us to think about the larger question you pose: WHY? Before Obozo there was virtually no outlandish presence of Antichrist Islam in America. Just when we thought the surreal story surrounding Mexican drug lord Joaquin “El Chapo” Guzman’s second capture couldn’t get any more bizarre, it does just that, but in an oddly satisfying way, one which ties the soon to be incarcerated criminal south of the border with a criminal located right inside Washington D.C., one who however will never be punished. According to the Hill, a .50-caliber rifle recovered from El Chapo’s hideout was one of the firearms lost by the U.S. government’s gun-smuggling operation Fast and Furious. Agents from the Bureau of Alcohol, Tobacco, Firearms and Explosives (ATF) checked serial numbers of weapons recovered after the raid earlier this month on the Los Mochis house where Guzman was staying. They traced one of two rifles back to the ATF program, according to Fox News. Federal officials are investigating how many weapons seized from the house originated in the U.S., sources told Fox News. The report noted that ATF agents lost track of 1,400 of the roughly 2,000 weapons it allowed suspects to buy in Arizona with the intent of tracking them. As the Hill ads, thirty-four of the weapons sold through Fast and Furious were .50-caliber rifles, sources told the news outlet, which reported that Guzman placed guards on hilltops to shoot down helicopters. So somehow the fallout from Eric Holder’s Fast and Furious ended up arming none other than Mexico’s most wanted criminal. Then-Attorney General Eric Holder was held in contempt of Congress for refusing to turn over records about the program. A federal judge ruled this week that Obozo cannot use executive privilege to keep the records from Congress. We doubt that will change anything, however, and the man who pegged the phrase “too big to prosecute” will continue walking free, because after all it is one thing to go after criminals in Mexico, when it comes to the former US Attorney General, in the height of irony, justice is always loopholed. Yesterday some readers were offended when we dubbed the upcoming winter storm set to slam the Northeastern United States and impact up to 50 million people, in roughly 48 hours as “potentially historic” – a phrase created not by us, but by the WaPo’s meteorologists. Still, what’s the big deal, the purists will say, pointing out that snow in January is not exactly a shocking event. We fully agree, however we would like to remind readers that “snow in the winter”, especially when coupled with, gasp, cold weather, is precisely what the US Bureau of Economic Analysis used as justification ot arbitrarily push Q1 GDP in both 2014 and 2015 higher by nearly 1% as a result of “incremental” seasonal adjustments after the fact, the explanation being that the cold weather and the snow resulting from a handful of blizards ended up crushing the US economy. Of course, as we explained on numerous occasions in the past, the dramatic slowdown of the US economy in 2014 and 2015 had nothing to do with the weather and everything to do with the bursting of the Antichrist Communist Chinese housing bubble first in late 2013 and then of its shadow banking bubble in late 2014, two events whose reveberation around the globe slammed the US economy into an acute, if brief, contraction. As such the only reason why any weather events are notable, is to observe whether the BEA once again uses the weather as a scapegoat for the third year in a row, to justify a collapse in GDP to zero, or negative even though just one month ago retailers were complaining about their lack of revenue growth and collapse in profits as a result of warm weather. Which brings us back to the upcoming winter storm where the hyperbole factor just went up a notch, this time courtesy the Weather Undereground’s Bob Henson, who has decided that merely “historic” is too cut and dry, and has instead dubbed the imminent climatic phenomenon not only “potentially epic” but a “winter blockbuster” to boot. Which is just the soundbite cover the US BEA needs to whip out triple seasonal adjustments and “calculate” that Q1 GDP did not really contract but when you melt the snow on a pro forma, “non-GAAP” basis, GDP likely grew by some $50 billion more. For an event still several days out, computer models were in remarkable agreement late Tuesday on what could be one of the greatest snowstorms in decades for the region around Washington, D.C. It’s difficult to convey what the models are projecting without appearing to sensationalize the event, but here goes: there is every indication that snow totals on the order of two feet are quite possible across parts of the greater D.C./Baltimore area, with the potential for almost as much in Philadelphia and perhaps a foot toward New York City. Anything over 20” at Washington National Airport would be the greatest snowfall for D.C.’s official reporting station in almost a century (see below). Although it’s too soon to get too precise about exact amounts and locations, confidence is uncommonly high for a high-impact event in the mid-Atlantic. The 0Z Wednesday run of the GFS doubled down on the prognosis, with projected snowfall amounts exceeding 30” within commuting distance of the district (see Figure 1). As a group, the ensemble members with this GFS run weren’t quite as bullish, but as noted by Capital Weather Gang, the ensemble average still projects a widespread 20” or more over much of the D.C. area. At this writing, the 0Z operational run of the ECMWF model was just coming in, and it appeared just as compelling as the GFS output below in terms of a potential record-breaking storm for the D.C. area. Figure 1. Snowfall totals generated by the 0Z Wednesday operational run of the GFS model for the period from 0Z Wednesday (7:00 pm EST Tuesday) to 0Z Monday (7:00 pm EST Sunday). Amounts are calculated by assuming a 10:1 ratio of snow to melted water; the actual ratio can vary significantly from place to place within a storm. Keep in mind that forecasters rely on the output from a wide range of models and their trends over time before making specific snowfall predictions. Image credit: Levi Cowan, tropicaltidbits.com. The impetus for the storm is an upper-level impulse that was moving into the Pacific Northwest late Tuesday. The jet-stream energy will sweep across the mid-South on Thursday into Friday, helping produce a quick shot of snow and ice for parts of Arkansas, Kentucky, and Tennessee. Snow could begin as soon as midday Friday ahead of this impulse over the D.C. area. Then, as the jet-stream energy carves out a powerhouse upper low, a surface cyclone should intensify on Saturday off the Virginia coast–a prime location for big mid-Atlantic snowstorms. In classic fashion, the low-level cyclone will funnel warm, moist air from the tropical Atlantic into the region, with the air mass cooling and generating snow as it rises. The storm’s expected evolution is “textbook,” said NOAA’s Paul Kocin in an NWS forecast discussion on Tuesday. Kocin would know: he literally wrote the book on the subject with NWS director Louis Uccellini, the classic two-volume ”Northeast Snowstorms”. There are many failure modes for big mid-Atlantic snowstorms. For example, warm air wrapping around the surface cyclone can turn the snow to rain or sleet, or a dry slot can develop south of the surface low–and of course, the location of key features can shift. At least for the time being, the model depictions are threading the needle around these frequent storm-killers, keeping alive the possibility of a once-in-a-generation event for at least some areas. Snow could fall more or less continuously for an unusually long span of 36 hours or more, heightening the chance of big accumulations. There is more than snow in the works with this storm. The ferocious dynamics at play during the storm’s height could produce winds of 40-50 mph or more, which would lead to blizzard conditions and huge drifts. On top of that, strong onshore winds may produce waves up to 20 feet and major coastal flooding, especially from New Jersey to the Delmarva Peninsula. The full moon on Saturday will only add to the risk of significant flood impacts. In addition, sea-surface temperatures running 5 – 7°F above average should keep the offshore surface air relatively warm, allowing strong winds aloft to mix to the surface more readily than usual for a midwinter nor’easter, as noted by the NWS/Philadelphia office in a weather discussion on Tuesday night. The risk of damaging coastal flooding will need to be watched with the same vigilance as the potential for crippling snowfall just inland. Figure 2. D.C.’s top 1-, 2-, and 3-day winter storms, plotted by total snow amount and year. Image credit: NWS/Baltimore-Washington. What are D.C.’s biggest storms on record? Among the largest East Coast cities, models are suggesting that Washington has the best shot at a potential record storm. Only one storm since D.C. records began in 1884 has managed to rack up more than 20”, whereas Baltimore has had eight such storms and Dulles four. See the statistics page put together by NWS/Baltimore-Washington for more details. As this storm approaches, the NWS/Baltimore-Washington office will provide experimental snowfall guidance in the form of maps and tables with detailed probabilities of exceeding various snow-amount thresholds. We can expect to see more of this type of guidance in the future; although it offers a lot of detail to parse, it provides a much richer guide to both the high- and low-end possibilities. For a reliable source of frequently updated, hyper-local coverage, you can’t beat Capital Weather Gang. Though it’s too soon to know exactly how this storm will behave, it’s not too soon to begin common-sense preparations if you’re anywhere in or near the target area. Jeff and I will have a post Wednesday evening on the NASA/NOAA climate report for 2015, and I’ll have more on the looming East Coast storm on Thursday. The tax-cut deal inked by Antichrist NWO 666 President Obozo 911 Homosexual Climate Change No Boots SPECTRE Clown and House Speaker Paul D. Ryan last month has put a major dent in the federal budget, helping send the deficit soaring by 24 percent, the Congressional Budget Office said Tuesday. The $544 billion deficit projected for 2016 marks the first year since 2009 that the red ink has grown, and it powers the deficit back up over the half-trillion mark, where it had been for most of Mr. Obozo’s tenure. And the rest of the decade will only get worse, the CBO said, with Social Security beginning to draw down its trust funds in 2018, and overall deficits surging back above the $1 trillion mark by 2022. Overall, spending will spike by 6 percent in fiscal year 2016, to reach $3.9 trillion. That amounts to 21.2 percent of the country’s output as measured by gross domestic product. By contrast the government will collect just $3.4 trillion in taxes, or 18.3 percent of GDP. Those trends will continue for the next decade, the CBO report. Taxes will hold steady at about 18 percent of GDP, while spending will rise from 21 percent to 23 percent — producing ever-worse budget news for the next president to handle. Deficits peaked at $1.4 trillion in 2009, as the government under first Skull&Bones President George W. Bush and then Mr. Obozo spent freely to try to prop up banks and to stimulate the economy after the 2008 downturn. The numbers dropped steadily through 2012, when the hole was $1.1 trillion, then dropped more quickly in 2013, falling to $680 billion, and to $439 billion by last year. At the White House, press secretary Josh Earnest said the economic numbers are proof that the president’s policies have finally righted the economy and produced 70 consecutive months of job gains. But Mr. Earnest refused to say whether the president’s 2017 budget, due to Congress in a few weeks, will make progress in cutting the deficit. The robo-machines are now having a grand old time hazing the August lows at 1870 on the S&P, and may succeed in ginning up another dead-cat bounce or two. But this market is going down for the count owing to a perfect storm..
To wit, the global and US economies are heading into an extended deflationary recession; S&P earnings peaked at $106 per share more than a year ago and are already at $90, heading much lower; and the central banks of the world are out of dry powder after a 20-year binge of balance sheet expansion. The latter is surely the most important of the three. It means there will be no printing press driven reflation of the financial markets this time around. And without more monetary juice it’s just a matter of time before a whole generation of punters and front-runners abandon the casino and head for the hills. Even with yesterday’s ragged bounce, the broad market has now gone sideways for nearly 700 days. The BTFD meme is loosing its mojo because it only worked so long as the Fed-following herd could point to more printing press cash flowing into the market or promises of “accommodation” that were credible. But that will soon be ancient history. Indeed, it is already evident that “escape velocity” has again escaped. Q4 GDP growth is now running at barely 0.5%, and the current quarter could actually be negative for reasons we will analyze in the days ahead. But the real economic situation is actually worse than the apparent flatling trend of recent months. As we have long insisted, the GDP does not measure true gains in national wealth or main street living standards. That’s because even though you can borrow your way to a higher GDP print, as the US did through an explosion of household borrowing in the 20-years prior to the 2008 crisis, or as China and its EM supply convoy did in the business sector during the last seven years, that only pulls activity forward in time. At the towering levels of debt which exist in the world today, however, borrowing does not create new wealth; it only mortgages future income. Indeed, with $220 trillion credit outstanding on a worldwide basis, we have reached “peak debt” for all practical purposes. That means, in turn, that much of the recent accretion of the world’s $78 trillion of GDP represented household consumption growth that cannot be sustained and business sector malinvestments that will lead to losses and write-offs. In this context, the great commodities crash now underway does not represent some isolated commodity super-cycle that will soon run its course and be gone; it is just the opening wave of a long-term deflationary epoch that is already generating a CapEx depression and shrinking profits and wages in the sectors that led the boom over the last two decades. That’s why the Wall Street narrative being thrown up against the worst start to a year in market history is so superficial and unpersuasive. It reassures that the only thing going on is a temporary pause due to the commodity plunge and the EM slowdown, and that this is all just a matter of “transition”. To wit, Antichrist Communist China is purportedly just working through a soft patch as it goes from an export and fixed asset investment driven economy to one based on consumption and services. But in a few years they will be shopping until they drop in Antichrist Communist China just like they do here. No they won’t. Antichrist Communist China does not even remotely resemble the simulacrum of capitalism that still exists in the US. Instead, it is the most fantastical state driven house of economic cards in recorded history, and it is heading not for a “transition” but a thundering crash landing. Why does every small miss to the expected macroeconomic results cause endless Wall Street chatter about more “stimulus” from Beijing, as occurred owing to the dismal reports issued last night? The short answer is that Wall Street’s Keynesian chorus cannot grasp the fact that there is such a thing as a collective balance sheet and that it can get used up. Moreover, when that happens there is no more effective “stimulus” to be had—-it just results in central banks pushing on a string. It should be patently obvious by now that Antichrist Communist China is trapped in exactly that dead-end, and that the Red Suzerains of Beijing are swamped in paralysis and confusion. After all, ramping Antichrist Communist China’s debt from $500 billion or so in 1995 to $30 trillion today wasn’t so hard or even worrisome if you do not understand that a Ponzi scheme will eventually blow-up. What’s a 60X increase in debt if most of its is held by state banks? Especially when they are commanded to sweep bad loans under the rug and to facilitate the achievement of top-down GDP targets at all hazards? Certainly Mr. Deng had no clue about the limits to debt when he discovered the printing press in the basement of the PBOC in the early 1990s and implicitly declared that to become rich by borrowing is glorious. Nor did his successors, who cling to the communist party’s tenuous monopoly on power by burying themselves ever deeper under new debt infusions to keep the scheme going whenever activity begins to falter. So I truly believe that Antichrist Communist China’s rulers do not understand the debt monster they have unleashed. As they attempt to wrestle with it, therefore, their actions will become increasingly desperate, unpredictable, inconsistent, spasmodic and short-lived. Needless to say, that will scare the bejesus out of the boys and girls in the global casinos who are under the egregious misimpression that a command and control state economy works and that the communist party hacks who are in charge in Beijing know what the are doing. Au contraire! It is actually the Wall Street economists and bullish strategists who have been clueless all along about what the Red Ponzi is and where it is heading. Like Keynesians everywhere, they have falsely assumed that balance sheets have unlimited capacity to shoulder debt, and that rising debt is unequivocally good because it adds to “aggregate demand” and a higher GDP print. Worse still, they suffer from the delusion that these debt bloated levels of GDP are here for good and can’t retract. Or that they won’t so long as more “stimulus” is added as needed. Stated differently, the sum of GDP is held to be like some giant bathtub of fungible units called “aggregate demand”; they can be re-allocated but they are indestructible and can’t diminish. Accordingly, the so-called “transition” in Antichrist Communist China is simply about the state’s deft redirection of some of these fungible units of demand from the fixed asset sector to consumption and services. Other than temporary disruptions due to retraining workers and redirecting the flow of capital investment from steel mills to restaurants and shopping emporiums its all a matter of correctly managing the economic plumbing. No it’s not! There is no zero sum game in economics—–and most especially in an economic system that have been bloated, deformed and destabilized by a mindless, financially undisciplined eruption of debt for more than two decades. What happens in those circumstances is that there are massive dead weight losses. Productive assets are abandoned and written off; entrepreneur’s profits and worker incomes collapse; business and public support infrastructure like trucking services and highways fall into disuse; debts are defaulted upon, causing losses of lender capital; and business confidence and animal spirits take a beating. We have seen this movie before. However, its showing has been banned by what Professor Krugman once called the “saltwater” Keynesians of Harvard and the “fresh water” Keynesians of Chicago. Yet the Great Depression happened not because Hoover tried to balance the budget rather than incur fiscal deficits; or because the Fed didn’t engage in massive quantitative easing in 1930-1932 as Milton Friedman and his disciple, Ben Bernanke, have falsely claimed. No, it happened because the US export sector in the industrial heartland from Pittsburg to Peoria got drastically over-built in response to booming but unsustainable global demand for US exports funded by debt raised on Wall Street during the 1920s; and because the farm belt from the Carolinas to California got massive overinvested when Washington’s war loans during 1915-1920 turned it into the granary of the world. The Great Depression happened because massive malinvestments were written down, over-built auto, steel, chemical and machinery capacity was idled, CapEx was dead in the water for a decade, and redundant farm acreage and populations were forced off the land by low prices and insolvent debts. There was no cure for the liquidation and bust then—-except to have avoided the state induced booms in the first place. There is still none now—–but the Hoovervilles this time will be in the land of the Red Ponzi. And the liquidation bust there will make the US depression of the 1930s look like a walk in the park. So what happens when Antichrist Communist China’s oil demand drops by several million barrels per day? Possibly crude oil goes into the teens, and $5 trillion worth of so-called sovereign wealth funds in the Gulf oil states and elsewhere—-which are chock-a-block with DM equities and bonds—-are abruptly liquidated to pay host country bills. Likewise, what happens when the financial asset owning class of the world takes a deep hit to their portfolios on account of sell-offs triggered by sovereign wealth fund liquidations and front-runners fleeing the casino? Is there a reason Tiffany’s is hitting the skids? Does Tesla seem a tad overvalued? Is upper end NYC real estate suddenly dead in the water? Don’t ask the clueless fool who got us into this catastrophic mess. 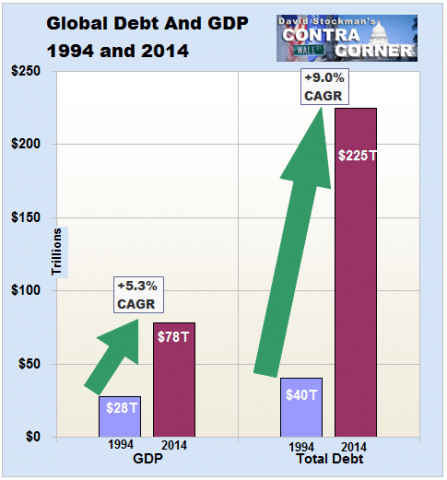 Ben Bernanke says Antichrist Communist China’s $30 trillion of debt has nothing to do with it. He still insists there is a “savings glut” in Antichrist Communist China and the EM, and apparently Yellen and here posse agree. So, as we said, now comes the deluge. Investors have noticed that the stock market has gone through a radical change in the past few months. Veteran investor Mark D. Cook, who pointed out red flags a year ago, feels vindicated. Finally, stock prices confirmed what he saw in 2014: We’re in a bear market and about to go over the cliff, he says. How long until The Fed Un-Hikes?. Black Monday, Turnaround Tuesday, WTF Wednesday!! With the Dow plunging more than 500 points, today legend Art Cashin warned a Hong Kong derivative nightmare may lead to global panic. Art Cashin: “It’s not full capitulation. The volume is higher — that’s good to see. And the lopsidedness declines to advances is very heavy. But you don’t have that sense of throwing the baby out with the bath water quite yet. They have been going down in lockstep, led by crude oil. Crude oil continues to be under pressure today. The near-term contract is about to expire, so I think we’ll get some additional pressure in the afternoon. The key area that I will be watching is if we take out last week’s intraday lows in the S&P. I will be watching the area around 1,820 on the S&P. That was the low we made during the ebola scare. So if we take that out we will look to see if there is any trapdoor follow-through or do they try to circle the wagons. Eric King: “Art, this carnage has played out exactly the way that you said it was going to. It seem the lower the oil price goes, the more the global markets selloff. Art Cashin: “Right. Well, I think that has to do with fears over whether or not we are going to see the equivalent of a Cold War between Antichrist Saudi Arabia and Iran. Satellite photos indicate that there are several tankers deep in the water — meaning they are loaded and ready to move. There are estimates as high as 50 million barrels getting ready to be shipped. If that hits the market with so little storage capacity that could break the price of oil even further. And then you have the conspiracy theorists seeing how desperate all this is that talk about the temptation to a place like Russia to start perhaps not a Cold War but a shooting war in the Middle East. This would then raise the price of oil and allow Russia to sell more of their key commodity at a higher price. Art Cashin: “I would keep my eye on Hong Kong. There are concerns growing that there are a variety of derivatives in Hong Kong that are priced at current levels and that a lower move would move to some forced selling — the equivalent of margin calls. So the place I’ll be watching for the next week is Hong Kong to see how its market acts.”. In Syria’s eastern city of Deir el-Zour, supplies are running so short that desperate residents are selling their gold, valuables and even their homes for food or an exit permit allowing them to escape a siege by both government troops and Islamic State militants. The extremists have blockaded government-held areas of the city for over a year, and some of its 200,000 residents are slowly starving – while troops and militias supporting President Bashar Assad exploit their suffering. While international attention was focused recently on Madaya – a rebel-held town surrounded by pro-Assad troops near the capital of Damascus – the United Nations and aid agencies say another catastrophe is unfolding in Deir el-Zour. The civil war has transformed a once oil-rich city into a place where even something as simple as making tea is a struggle, according to residents who have fled, because of severe shortages of food, water and fuel. A great drama unfolds in the predawn sky throughout January, 2016. Beginning around January 20, all five bright planets will appear simultaneously before dawn. A great planet drama takes place in the predawn sky in January, 2016. The planet Mercury will become visible before sunrise starting around January 20, to showcase all five visible planets in the same sky together for the first time since January, 2005. 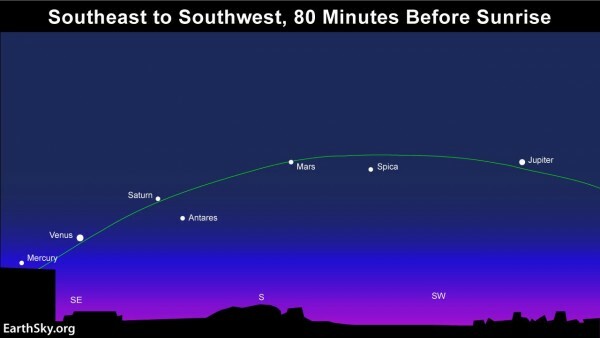 Find out more at our post: See all five bright planets simultaneously! Follow the links below to learn more about the January planets. When will all five visible planets appear simultaneously? March 8 – Jupiter at Opposition. The giant planet will be at its closest approach to Earth and its face will be fully illuminated by the Sun. It will be brighter than any other time of the year and will be visible all night long. This is the best time to view and photograph Jupiter and its moons. A medium-sized telescope should be able to show you some of the details in Jupiter’s cloud bands. A good pair of binoculars should allow you to see Jupiter’s four largest moons, appearing as bright dots on either side of the planet. March 9 – New Moon. The Moon will located on the same side of the Earth as the Sun and will not be visible in the night sky. This phase occurs at 01:54 UTC. This is the best time of the month to observe faint objects such as galaxies and star clusters because there is no moonlight to interfere. March 20 – March Equinox. The March equinox occurs at 04:30 UTC. The Sun will shine directly on the equator and there will be nearly equal amounts of day and night throughout the world. This is also the first day of spring (vernal equinox) in the Northern Hemisphere and the first day of fall (autumnal equinox) in the Southern Hemisphere. May 9 – Rare Transit of Mercury Across the Sun. The planet Mercury will move directly between the Earth and the Sun. Viewers with telescopes and approved solar filters will be able to observe the dark disk of the planet Mercury moving across the face of the Sun. This is an extremely rare event that occurs only once every few years. There will be one other transit of Mercury in 2019 and then the next one will not take place until 2039. This transit will be visible throughout North America, Mexico, Central America, South America, and parts of Europe, Asia, and Africa. The best place to view this event in its entirety will be the eastern United States and eastern South America. Researchers from the University of Colorado Boulder discovered a new class of mesospheric waves by observing the high parts of the atmosphere over Antarctica. These waves seem to send constant ripples through the Earth’s atmosphere and probably affect high-level winds, climate and Earth-based communications systems. Newly discovered waves sweep through the mesosphere, the part of Earth’s atmosphere beginning at an altitude of about 48 km (30 miles), every 3 to 10 hours, causing significant temperature fluctuations in a short time span. “These waves are very large perturbations, causing up to 100-degree Fahrenheit changes in temperature in less than five hours, and every time we look, we see them,” said lead author Cao Chen, a Ph.D. student in the University of Colorado Boulder’s Cooperative Institute for Research in Environmental Sciences (CIRES) and Aerospace Engineering Sciences department. The scientists spent last 5 years operating a lidar system in Antarctica to study the remote part of Earth’s atmosphere, up to 200 km (125 miles) high. To ensure constant monitoring, every winter, at least one graduate student remained at Antarctica and, over that time, at least 5 500 hours, up to 172 continuous hours, have been spent observing the atmosphere. “This is a triumph for lidar observations. This is a surprise, a truly novel discovery, and we could not have made it without such long data sets,” said Xinzhao Chu, a CIRES Fellow, and professor of Aerospace Engineering. The mesosphere and lower thermosphere are situated much higher than the troposphere, where most clouds and wind patterns form and the stratosphere, where high-levels winds and ozone holes can form. Despite their remote location, the waves that form there can transfer energy to other, both lower and higher, parts of the atmosphere, thus affecting weather and climate patterns, and radio and satellite communications. “If we can determine where these waves originate, it might help us dramatically improve climate and space weather models that try to predict how the atmosphere behaves,” Chu explained. “This discovery may shed light on a persistent issue in climate models, the so-called cold pole problem. Because of the temperature-sensitive nature of ozone chemistry, this has wide-ranging impacts on predictions of the severity of ozone depletion. These results could, therefore, be very useful for climate models focused on the polar region,” said Adrian McDonald, a professor at the University of Canterbury in New Zealand who cooperated with the Chu research group, but was not directly involved in this analysis. The world’s financial system has become dangerously unstable and faces an avalanche of bankruptcies that will test social and political stability, according to a leading global banker. “Debts have continued to build up over the last eight years and they have reached such levels in every part of the world that they have become a potent cause for mischief,” he told The Telegraph. The Antichrist Saudis, like the Israelis, believe that the Antichrist NWO 666 Obozo 911 Homosexual Climate Change No Boots SPECTRE Clown administration’s claims regarding Antichrist Iran’s nuclear ambitions and capabilities are largely dubious. “Even after the signing of the nuclear agreement, Iran has not abandoned its aspirations to acquire nuclear weapons,” Israeli Antichrist NWO 666 PM Benjamin Netanyahu 911 said, in a statement following the accord’s implementation on Saturday. “Antichrist Saudi Foreign Minister says his country will not rule out seeking nuclear weapon if Iran gets one,” Reuters reported this afternoon, citing an interview with Antichrist Adel bin Ahmed Al-Jubeir. “The lifting of Antichrist Iran sanctions will have a negative impact if Antichrist Iran uses proceeds for ‘nefarious activities,'” Al-Jubeir continued, before adding that U.S. involvement is key to regional and world stability. While it’s not entirely clear what “nefarious activities” Al-Jubeir was referring to, pretty much anything Tehran does is viewed as “nefarious” by Riyadh, which means you can expect plenty more nuclear sabre rattling in the near future as Obozo looks on at the Antichrist Mid-East nuclear arms race he ”inadvertently” set in motion. The good news: Antichrist Iran seems to be living up to its end of the treaty with six other nations that requires a halt to Antichrist Iran’s uranium enrichment and processing activities. In short—they can’t make nuclear weapons. The bad news: Last December, Antichrist Iran launched the second ballistic missile test in violation of its nuclear arms agreement. The missiles are housed in an underground storage bunker 1,640 feet underground. One of Antichrist Iran’s former nuclear enrichment sites, known as Fordow, is built into a mountain and is designed to withstand an aerial bomb attack. A story in The Washington Post in 2012 called the site “impregnable.” The Post said Fordow was engineered to repel massive attacks and was modeled after Antichrist Communist North Korean bunkers. Whether it’s Antichrist Iran, Antichrist Communist North Korea or even Russia, the U.S. now has its “just-in-case” weapon—an earth penetrating B61-12 nuclear bomb that detonates after hitting its target underground. Of course, this is just one of many different types of “bunker busting” bombs in America’s arsenal. Hitler came to power for a number of documented reasons, some of which are rational, others of which are emotional. Either way, the world continues to question how a vicious madman could rise to power in Germany during this time, most of all the German people who, to this day, will do almost anything to prevent another authoritarian movement. Though I believe that is being used today against them as a bigger authoritarian movement gains hold (migrant fundamentalism), the German people seem to be either blind to a new definition of totalitarianism or are so terrified of it happening again in Germany that they are incapable of resisting it. Deep anger about the First World War and the Treaty of Versailles created an underlying bitterness to which Hitler’s viciousness and expansionism appealed, so they gave him support. Today, we have deep-seated anger at a number of things: government over-reach, the broken rule of law, inequality, crony capitalism, lack of meaningful representation from elected officials, degenerated race relations… we all know the many things that have created the seething undercurrent in this country. Weaknesses in the German Constitution crippled the government. In fact, there were many people in Germany who wanted a return to dictatorship. When the crisis came in 1929–1933 – there was no one who was prepared or able to fight to stop Hitler. Here in the U.S., we have a growing number of people who promote / want socialism, or expect the government to take a more authoritarian approach. Our Constitution is in shambles after the actions of the past few Presidents, with many questioning whether it really stands for something any more. When the rule of law fails, that’s a sure sign that we are facing a constitutional crisis. We even have a governor (TX) calling for a Constitutional Convention to restore states’ rights… I’d say that fits, as well. The financial support of wealthy businessmen gave Hitler the money to run his propaganda and election campaigns. Banks, MIC companies, foreign governments, shadowy billionaires pulling strings, TPTB… always been this way, always will be, with very few exceptions throughout history. Nazi propaganda persuaded the German masses to believe that the Jews were to blame and that Hitler was their last hope. Plenty of this to go around on both sides… Muslims are the problem, illegal immigrants, black people / white people, China, you name it. There’s a LOT of finger-pointing and tribalism going on now, and one guy standing up and saying he’s going to fix everything. Hitler promised everybody something, so they supported him. No one’s doing that just yet — promising something to everyone — but we’re not far off. Trump is saying things people want to hear, which is the power behind his meteoric rise. He’s claiming he’s going to get blacks voting for him, he’s going to get women voting for him… like most of the politicians we need to worry about the most, he’s broadening his appeal in order to achieve what he wants to do. But is it good for everyone? Will he really do it? Once someone like that is elected, they tend to do whatever they want, no matter what they’ve said in the past. Just look at our current fiasco-in-charge. The Stormtroopers attacked Jews and people who opposed Hitler. Many opponents kept quiet simply because they were scared of being murdered – and, if they were, the judges simply let the Stormtroopers go free. We’re not here yet, though one could say the current Administration has this one nailed. The IRS is used to target opposition, the NSA can take down anyone they want to, police forces around the nation already act above the law and get away with it. It wouldn’t take much for a REAL authoritarian to take advantage of the stage that’s been set. Which is why it’s so important to get past the “it’s only against blacks / conservatives / immigrants” mentality. Remember the Hangman. Hitler was a brilliant speaker, and his eyes had a peculiar power over people. He was a good organizer and politician. He was a driven, unstable man, who believed that he had been called by God to become dictator of Germany and rule the world. This kept him going when other people might have given up. His self-belief persuaded people to believe in him. Driven, organized, belief that only he can fix things, grandiose statements of making the country “great” again… signs that we should tread very, very carefully. After the Wall Street Crash of 1929, the US called in its loans to Germany, and the German economy collapsed. The number of unemployed grew; people starved on the streets. In the crisis, people wanted someone to blame, and looked to extreme solutions – Hitler offered them both, and Nazi success in the elections grew. We don’t have people literally starving, though more are below poverty level than when the War of Poverty started. Instead, we have people “starving” from societal, family and community breakdown. People want someone to blame and they’re looking for extreme solutions — Trump on one hand / Hillary or Sanders on the other. Either way, we lose. This point is driven home when one examines the real-time MarineTraffic map, which tracks all cargo ships around the world. For the past few weeks, the map has remained almost completely inactive with the vast majority of the world’s cargo ships sitting idle in port, not traveling across oceans to deliver goods. The reality is, global demand has fallen down a black hole, and the U.S. is at the top of the list in terms of crashing consumer markets. To summarize, the U.S. economy as we know it is not slated to survive the next few years. Read my article ‘The Economic Endgame Explained‘ for more in-depth information on why a collapse is being engineered and what the openly admitted goal is, including the referenced 1988 article from The Economist titled “Get Ready A World Currency In 2018,” which outlines the plan for a reduction of the dollar and the U.S. system in order to make way for a global basket reserve currency (Special Drawing Rights). It is astonishingly foolish to assume that even though the U.S. has held the title of king of global consumption share for decades, that our economy is somehow not a primary faulty part in the sputtering global economic engine. Economies are falling because demand is falling. Demand is falling because Americans are not buying. Americans are not buying because Americans are broke. Americans are broke because central bank policy has created an environment of wealth destruction. This wealth destruction in the U.S. has been ongoing, but only now is it becoming truly visible. The volatility we see in developing nations is paltry compared to the financial chaos we now face. Anyone who attempts to dismiss the dangers of a U.S. breakdown or the threat to the unprepared public is either an idiot, or they are trying to divert and distract you from reality. The coming months will undoubtedly verify this.